Late hours to help you when you need it. Delivery at NO extra charge. Low overhead to provide low cost. High quality parts, backed by a nationwide warranty on everything we sell. We are constantly adding the parts you need. Our sales representatives can save you time by managing your inventory for you. Affiliation with over 700 parts locations. By taking advantage of our large network we offer discounts on : uniforms, credit card processing and office supplies. Large inventory growing with a new expansion of 6,000 square feet warehouse. We also offer training: at your shop, over the web, and safety training with test. 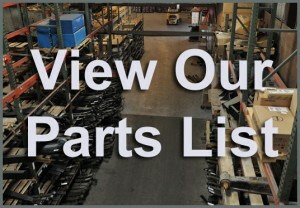 See a complete list of parts that we carry along with our featured manufacturers.